We’d love your help. Let us know what’s wrong with this preview of Rescue Matters by C.J. English. Rescue Matters: 4 Years. 4 Thousand Dogs. An incredible true story of rescue and redemption. An incredible true story of rescue and redemption. In a forgotten land where lives are lost, souls are sometimes found. When Keith Benning accepted the job as a deputy in a small North Dakota county, he had no idea he was about to face the biggest challenge of his life. Four years and four thousand dogs later, he lost his marriage, a fellow officer and nearly his own life. By rescuing seventy starving and unwanted animals out of his garage each month, Keith and a small team of volunteers have changed the world for thousands of dogs, and tens of thousands more to come. Woven with riveting and inspiring real-life rescue stories, Rescue Matters tells a larger tale of tragedy-meets-redemption. A gripping account of how a garage rescue grew into a mighty force that inspired a nation. C.J. 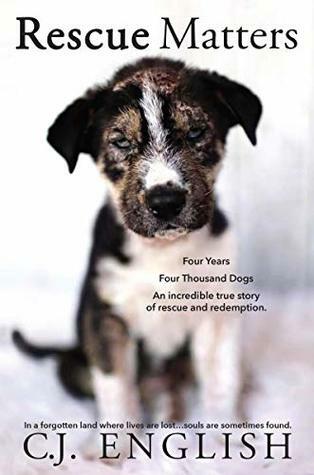 English shares her personal experience inside the emotional and bittersweet world of dog rescue, delivering a heart-wrenching and deeply moving story that has much to teach us about responsibility and compassion. Rescue Matters is alive with meaning and purpose, proving that that it doesn't take a law or government to change the world, all it takes is a few people trying to make a difference to start a revolution. Not just for dog lovers, but for anyone inspired by the compassion of humans and the resilience of the animals who forgive them. 50% of the profits from the sale of this book will go directly back to Keith and his team at Turtle Mountain Animal Rescue. To ask other readers questions about Rescue Matters, please sign up. Rescue Matters - not just a book title but two words that have a deep and emotional meaning. Once you read this book I hope you will agree with me. She has opened my eyes to a crisis I was completely oblivious to. And if you think that this crisis is isolated to just North Dakota,( like I was initially) Rescue Matters - not just a book title but two words that have a deep and emotional meaning. Once you read this book I hope you will agree with me. She has opened my eyes to a crisis I was completely oblivious to. And if you think that this crisis is isolated to just North Dakota,( like I was initially), you would be very wrong. Whilst on holidays earlier this year I witnessed a similar situation in a place that is circa 14,000km’s from North Dakota and I truly believe that I would not have seen the situation for what it was if i hadn’t been aware of TMAR from my conversations with Ms English. This is not fiction but a true life story of how TMAR came into existence. It’s not sugar coated but a real depiction of the hard road these wonderful volunteers, rescuers, and man best friend have endured for the last 4 years. As I was read these stories I was moved to tears and messaged Ms English to express how in awe I was of the brave, strong and selfless people in this book - and that I wanted to donate every last cent I had in my bank account to support them and the fantastic work they do. So yes this book will rip your heart out but there are beautiful heart warming and good outcomes as well. The stories of the dogs, puppies, cats, kittens and a few other unexpected animals in this book made me cry both happy and sad tears and will never be forgotten. Please do yourself a favour - buy this book, support the cause, like their Facebook page and spread the word!! 50% of the profits from the sale of this book go directly back to Keith and the team at TMAR. People that don't know about animal rescue and those that are already involved in animal rescue can learn so much from this story. I, like the author, CJ English, grew up in Fargo, ND and only knew about our family buying dogs from a breeder. Thankfully when I moved to California 17.5 years ago and adopted our rescue cats I started learning about animal rescue and have been volunteering for a local organization for 6 years. I wish I would have know about animal rescue sooner but it's never too la People that don't know about animal rescue and those that are already involved in animal rescue can learn so much from this story. I, like the author, CJ English, grew up in Fargo, ND and only knew about our family buying dogs from a breeder. Thankfully when I moved to California 17.5 years ago and adopted our rescue cats I started learning about animal rescue and have been volunteering for a local organization for 6 years. I wish I would have know about animal rescue sooner but it's never too late. Despite being an animal shelter volunteer for 6 years and now cat/kitten foster, Rescue Matters, revealed to me so many other layers that grass roots rescue groups like Turtle Mountain Animal Rescue have to overcome and the strength and courage to stay true to the passion for being the voice for animals and compassion for the people and communities involved. I hope this story, rescue and rescuers inspire you to take that next step in whatever you are passionate about and take it to the next level. I know it has inspired me to push the envelope in being an advocate for all the "invisible" and homeless animals. Turtle Mountain Animal Rescue makes me proud to be from North Dakota and I will be cheering and supporting them along their journey as they continue to save animals and lobby for improved animal cruelty laws in the state. Heartbreaking, but a must read. Thank you for writing the book. Thank you for your hard work. Thank you for not giving up. Thank you for bringing awareness. Thank you for teaching others not to assume a dog's story or to judge those who have to give up their dogs. Thank you for giving your all. Sincerely, thank you. This book is so eye opening to what TMAR does. These people are amazing. This book is heart breaking and heart warming at the same time. This book rocked me to my core and needs to be shared in every way. The moment CJ started 'Rescue Matters', I followed and read every posts about the dogs getting rescued and taken care of. This book is not meant only for dog lovers. It's a book that we all should read and share. CJ has poured her soul into this amazing book and we need more books like this. Hats off to CJ for taking the initiative to write this true story! I enjoyed this book a lot. I mean I didn't want to in the sense of the staggering sad numbers and statistics for rescue. But on the other hand to get an in depth look into the coming of an organization and to read some of the first hand testimonies or specific animal stories was amazing and humbling at the same time. I am in awe of these dedicated individuals and indebted to them. I only wish I made more money so that I could help more. I pray ND passes new updated legislation to help as well. It's amazing how one person can change a community. I love all the little dog stories. I could read that all day long. My next dog will come from TMAR for sure. Make sure you have tissues near by this book is a tear jerker for sure! C.J. writes across genres, her 2017 release WTF am I supposed to eat? A dieter’s manifesto was an instant kindle best seller in weight loss and won the Readers Favorite Book Award. Her upcoming works span across topics including fiction and non-fiction. C.J. English is an Amazon Kindle Best Selling Author in love and romance. Her breakout memoir AFFAIRYTALE, debuted at #1 in diaries and journals.